A 15-year-old Andy Robertson sits devastated, next to his parents in front of Celtic’s youth coaches John Sludden, John Gallagher and Chris McCart. The Glaswegian has just been released from his boyhood club, deemed “too small” he was understandably crushed by the news. Comforted by his family, Robertson feared this was the end of the road for his dream but knew what he had to do. Robertson found himself lost by football naturally, hit with the biggest curveball possible, you’d begin to question your own goals and dreams naturally. Rejection is a bitter pill to swallow, but the reaction from a young Robertson was to prove them wrong, work harder and make a name for himself. 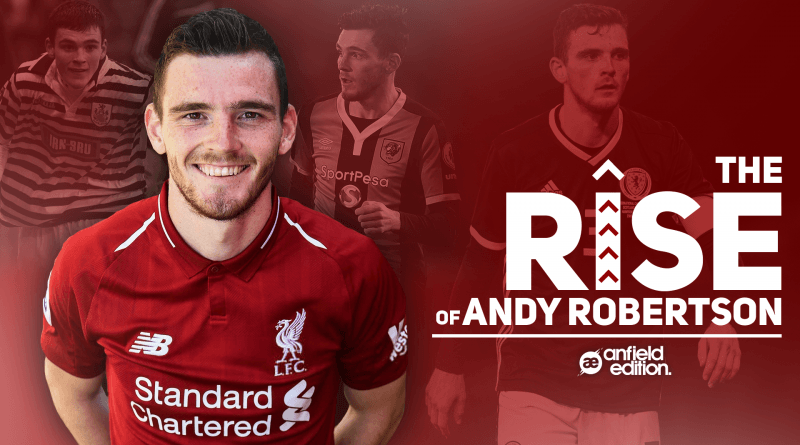 It’s this dogged attitude that is visibly present in his game, a determined tackler and an even more determined worker – Andy Robertson has cemented himself as one of the top full-backs in the Premier League over the last few months; but how did he get here? Amateur football at Queen’s Park was next for the now 17-year-old, he balanced a full-time job at Hampden Park taking ticket orders for Scotland’s International games – University was also on the cards, with a degree in Sports Science being eyed up. His parents were prepared to give him one last chance, a final season to make it professionally or it was time to pursue a higher education. The chance came, Dundee United came calling in June of 2013 and the meteoric rise began. Robertson made an instant impact on the Dundee faithful and English clubs – in particular Hull City, who were prepared to take a punt on the then 20-year-old for £3m. Spending three seasons at the Yorkshire club, including two relegations and one Championship play-off winning season – Robertson grew into the player we now recognise today. Under the watchful eye of Steve Bruce, Robertson brushed up on the technicalities of Premier League football and more nuanced tactical ideas, but something was still missing. Scoring five goals during his time with the Tigers, Robertson showed the attacking threat he posesses thanks to electric pace and a “no-regrets” mindset. All of this arguably launched from rejection. He’s got nothing to lose and you bet he will prove that on the pitch, this made him so effective in the final third where risk-taking is so crucial. It was a left-field solution, relegated Hull City that had conceded 80 goals across the Premier League season and looked far from a defensively solid team. Robertson, the left-back in that side was expected to fix Liverpool’s defensive problems and replace an-overly attacking Alberto Moreno; try to connect the dots. Liverpool fans were baffled but it was a no-brainer for Robertson: “The first time I spoke to the manager I was taken away by him and his plans,” said the Scotland International. As for Klopp, it took some time for him to be impressed by Robertson who simply wasn’t up to his standards to begin with. And take it he did. With Moreno picking up an injury in December that left him out of the squad for a lengthy amount of time – Robertson seized his chance. Pivotal in Liverpool’s Champions League run, the Scottish dynamo won over fans and critics alike. Especially a certain moment against Manchester City that I need not remind you of.